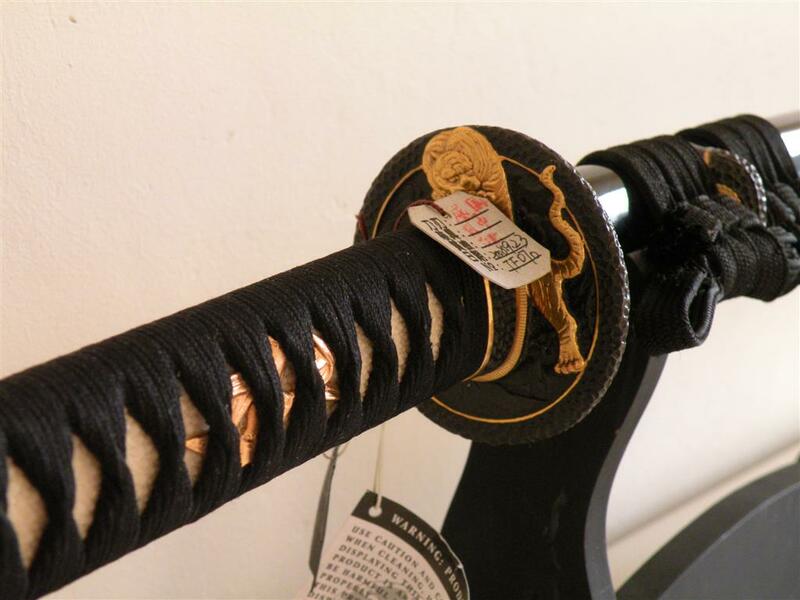 True samurai swords are in my opinion works of art which is why I decided to write these few but important katana care tips to make sure your Japanese sword keeps its value for a long time. 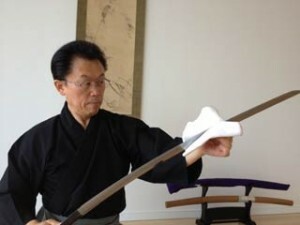 Unless you buy a stainless steel katana, you should expect to do some katana sword care frequently. A quality carbon steel blade needs to be occasionally oiled and cleaned to make sure it doesn’t deteriorate. Even bamboo practice swords like Shinai need to be maintained from time to time, so don’t expect a quality steel one to stay spotless forever. Make sure you read my tips below and learn how to keep your samurai sword in shape. First thing you should do when you purchase a brand new sword is to remove the oil from the blade. Swords that come out straight from factories often have a thick layer of oil or grease to make sure the blade doesn’t get damaged during transport. Lacquer thinner, mineral spirits or similar solvents are good at removing this layer of coating. After you removed the protective oil you should re-oil it with Choji, clove, or even synthetic silicone oil; any of these will do. More expensive swords often come with a maintenance kit containing everything you need, but if yours didn’t just buy one online. They usually cost about $15 and can last you for a long time. I already wrote an article about how to maintain your sword which also has a guide on how to use a maintenance kit so make sure you read it here. The same process needs to be applied for new swords as well. Below are a few facts you need to know about caring for your katana swords. Make sure you adhere to these rules and they will prevent your sword from rusting or becoming dull. It may seem obvious but the first thing everyone does when holding a katana in their hands is to feel the blade. You absolutely shouldn’t do that as the acids from your fingers can deteriorate the blade and cause it to rust. Perhaps you think the tough samurai sword can’t be hurt by a simple touch, but fact is it can. If you can’t help it, at least make sure to wipe and oil the carbon steel blade of the sword each time after it’s touched. To prevent rust on the carbon steel blade of your katana make sure you oil it regularly. You can use natural oils such as mineral, camellia or clove oil, or synthetic oils such as silicone based ones which usually come in a spray can. Oiling the blade takes less than 5 minutes of your time and you should do it each time after you used the sword, or once every three months if not used. This tip will help you with two things. First, your sword won’t collect dust which can over time damage your blade. And second you’ll prevent the saya (scabbard) from warping or otherwise distorting. Wood can bend or twist or otherwise lose form due to heat or dampness so keeping your sword in the scabbard is a good way to prevent that from happening. You should also occasionally take care of the wooden parts of the sword as well such as the aforementioned saya (scabbard) or tsuka (handle). You can protect them by lacquering, varnishing or waxing. For cleaning the wood a mild furniture lemon oil is recommended. Tsuka, Tsuba, Saya… Need to brush up on your katana terminology? Read my article about sword parts. If you’re banging your sword against your friends katana that’s the best way to damage it, so unless that’s your goal I suggest you avoid it. It may look cool in the movies but it will nick your blade, and the notches will be very visible over time and your sword will definitely lose its value. If you want to spar with someone use a shinai, if for no other reason then for safety. 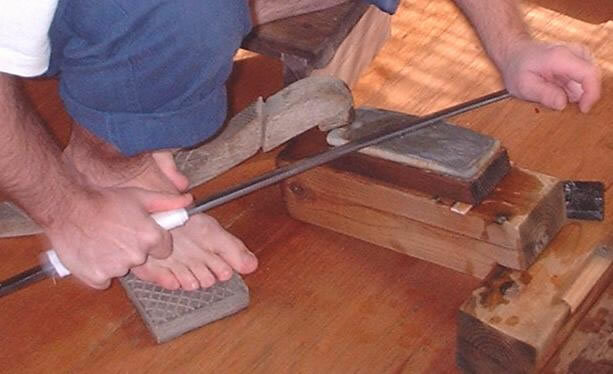 Sharpening and polishing swords is best left to professionals who know what they are doing. It’s a pretty lengthy process which isn’t easy, so I recommend you find a good sharpener in your area that can do the job for you. You can even find some sharpeners/polishers online who you might be able to mail the sword to, just make sure they are reputable for obvious reasons. I should also mention that sharpening usually isn’t necessary unless you’ve been doing a lot of cutting over the years. Always remember that Japanese swords aren’t toys or kitchen knives. They are an item worthy of your respect and should be treated as such. If you want to have a sword that needs absolutely no care and maintenance get a cheap stainless steel one. More expensive carbon steel katana are too valuable to be left to rust.